Divisions of up to three ships can be created. Currently divisions can only have one carrier (and a random team can have no more than two carriers). Matchmaker treats all the ships in the platoon as having the same tier; so if, for example, a tier 3 and a tier 7 ships division together, matchmaker views both of them as tier seven ships and will assign them to battle accordingly. For that reason, it is never a good reason to platoon with ships that vastly differ in tiers (so-called "fail divisions") -- you will weaken your team, and draw the wrath of your teammates. The AA aura for dual-purpose secondary guns persists even if they are firing at surface targets. Each second an enemy aircraft squadron is in the ship's AA aura, it takes certain amount of damage per second. When the squadron is close to your ship, it takes combined (i.e. additive) damage from all your ship's AA guns' auras. Each AA guns' range and damage per second can be viewed in port. These characteristics can be modified by commander skills, equipment, and consumables. For instance, selecting an enemy squadron with ctrl + click increases the AA aura DPS by x1.5; using the anti-AA cruiser consumable increases that DPS by x6. Let's imagine that a squadron of six Martin T4M torpedo planes are in the medium-range aura of Pensacola. The squadron will have 970*6 = 5820 survivability; the Pensacola with no mods and inactive anti-AA ability will do on average 124 damage per second. Theoretically, the enemy squadron will lose an airplane every ~8 seconds, and the entire squadron will be destroyed in 46 seconds. In practice there will be some variation, because the AA damage isn't constant; the value you see in port is the average damage per second. Essentially, just think of the survivability/AA DPS interaction as ship's probability of shooting down an airplane per second. Each ships' aura interacts with the air squadron independently, even when the auras intersect. So if you didn't shoot down any airplanes while the squadron was in your aura, by the time it enters another ship's AA aura the game will consider it to be full survivability again for the purpose of "saving throws" against the AA. Torpedoes have a minimum arming distance. Once the torpedo is armed it will always explode when hitting a ship; non-explosions or ricochets are not planned for the game. Torpedo hits into bow/stern -- deals about 0.9x the listed torpedo damage, independent of ship type. Torpedo hits into a mid-section of a destroyer -- increased damage (multiplier of 1.36x to the listed damage). Flooding damage reduces ship's fighting capability by 0.66-0.12% of total HP per second, depending on ship's tier. Higher-tier ships receive less damage as % of their health than do low-tier ships. Flooding probability depends on the place of the torpedo hit. Torpedo reaction times, i.e. the time it takes for the torpedo to travel across its detection range, assuming a stationary target. In the real game, moving towards the torpedo will reduce the reaction time, and vice versa. Torpedoes with green highlighted reaction time numbers are harder to dodge. A ship has to be both a military base and a combat vehicle, since it is designed for long autonomous operations. Therefore a significant portion of the ship's interior space is needed for the every-day activities, but has no direct effect on ship's fighting capacity in the critical moments of the battle. 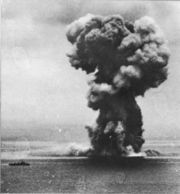 A shell that destroyed the ship's laundry room or the galley in an artillery duel would have much less of an effect on combat capability than a shell that hit the magazine or the engine compartment. That is why, unlike the vehicles of World of Tanks, ships in World of Warships are divided into multiple compartments, each with a different value of hit points (HP). Roughly, the compartments are as follows: bow, stern, citadel, casemate (center part minus the citadel), and the superstructure. The total value of HP for all the compartments is roughly twice the ship's total hit point value ( fighting efficiency): in real life, the ship would be out of battle long before every last portion of it is destroyed. 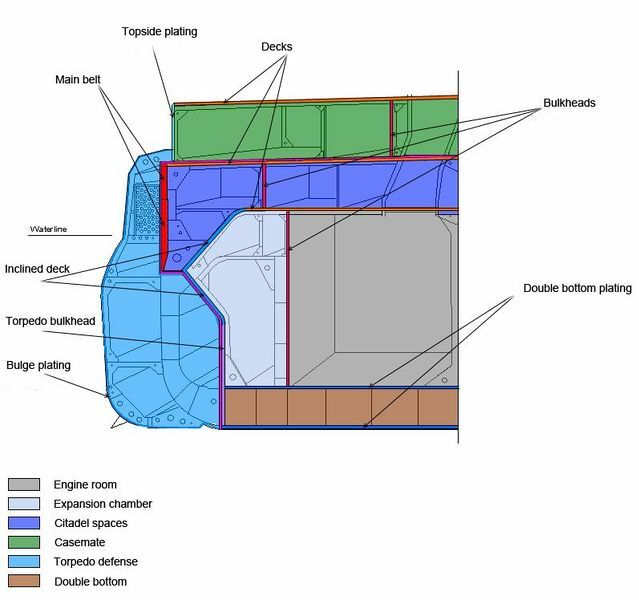 Furthermore, armor in World of Warships is not just a uniform barrier to be pierced (like in WoT), but rather a kind of multi-layered “cake” that covers a number of construction elements and mechanisms, each having specific armoring. A projectile that enters the ship can encounter up to four or five layers of armor and may be stopped or ricochet at each layer. In this regard the developers attempted to adhere to historical realism and simulate all significant layers of armor. The armor tends to be very heavy: on a typical battleship it takes up around 40% of the total displacement of the vessel. Therefore, battleship designers tried to save some of that weight by placing heavy armor only around the vital parts of the ship: the ammunition and propellant magazines, the propulsion plant, the fire-control, command and communications sections. Most of the other compartments are almost completely unarmored. This approach of providing either total or negligible protection is referred to as "all or nothing". In effect, the scheme accepts vulnerability to medium-caliber and high-explosive shells striking the unarmored sections of the hull, in order to improve resistance against the heaviest armor-piercing shells, while at the same time being able to carry a powerful armament and retain useful speed and endurance. The ship's vital parts are protected by a citadel, which can be visualized as an open-bottomed (closed top) rectangular armored raft with sloped sides sitting within the hull of the ship. Although it was desirable for the citadel to be as small as possible, the space enclosed was an important source of reserve buoyancy, and helped prevent the ship from foundering when other compartments had flooded. In game, taking the citadel's HP to zero would effectively destroy the ship, even if none of the other compartments were affected. From the citadel box box, shafts known as barbettes lead upwards to the ship's main gun turrets and conning tower. The ship's magazines are located in our around the turret barbettes, and contain the main caliber shells, as well as the gunpowder charges. Penetrating the citadel armor around the magazine often results in a spectacular one-shot kill. How can a player know where these important compartments are when he or she fires into the side of an unfamiliar ship? Short of looking up ship's blueprint, an educated guess will have to suffice. The citadel is normally located in the middle of the ship, and is roughly half the ship's length. As a rule-of-thumb, when you have a clear shot at the side of the ship, aim in the middle of the ship (just below the smokestacks), and close to the waterline. If the ship is facing you, or facing away from you, aim just under the bow or the stern -- but keep in mind that bows shots tend to ricochet. The magazines are normally located just under the main caliber turrets. In addition to belt armor, which protects battleships from direct fire, they also have deck armor that protects them from plunging fire -- shells at extreme engagement ranges tend to hit the top of the ship. However, due to to a large area that would have to be protected, battleships' deck armor is much thinner than the belt armor. As such, shells fired to strike the deck may be able to defeat the armor while those same shells may be incapable of penetrating the side armor of the target vessel. One, of course, could forgo trying to penetrate the ship's, and instead shoot up the ship's superstructure, bow, and stern with high-explosive shells, disabling all the supporting elements of the ship, and turning it into a fiery inferno that is no longer capable of combat. However, a skilled captain that knows how to hit the ship's vital areas with armor-piercing shells can often dispatch an enemy in just a few salvos. There are multiple modules in-game: engine, propeller, anti-air emplacements, torpedo tubes, main caliber turrets, etc. The modules have three states: functioning, damaged, and destroyed. A damaged module loses function until it is repaired, a destroyed module cannot regain function. Some modules can only be damaged but not destroyed (e.g. propeller), other modules can only be destroyed but not damaged (e.g. AA emplacements). Each module has a certain amount of HP. Every time that module is damaged, the game calculates a probability of it being damaged (that probability can be lowered by 34% with a tier 5 commander skill). The probability of a critical hit that leads to damage increases for lower module HP values. Once the module reaches zero HP, it is destroyed. The ballistic models for AP and HE shells are identical. Shell's in-game tracer may not coincide with the actual trajectory, in order to better visualize the shooting process. These shells have an instant fuze, and burst immediately upon hitting a target. As a rule-of-thumb, HE shells do about 1/3 of the max damage that is displayed in-port. Although they have a certain armor penetration capability, equal to about 1/6 of shell's diameter as of patch 0.4, one shouldn't try to penetrate heavy armor with these shells (naturally, hitting citadels of certain lightly armored cruisers and carriers with HE is fair game). Instead, HE shells are best used for knocking out modules, such as anti-aircraft emplacements, and starting fires. A single fire causes the ship to lose 0.3% of fighting capability per second for battleships, cruisers and destroyers, and 0.4% of fighting capability per second for carriers. Ship's base anti-fire coefficient is equal to roughly 1 at tier 2-3, and roughly 0.5 at tier ten. The exact values haven't been disclosed by WG; the only value currently known is for Fuso -- 0.76 stock, 0.7 fully upgraded. Damage Control Mod 1 is 0.05 if the appropriate equipment is installed, and zero otherwise. Fire Prevention is 0.07 if the appropriate skill has been acquired, and zero otherwise. Demolition Expert is 0.03 if the appropriate skill has been acquired, and zero otherwise. 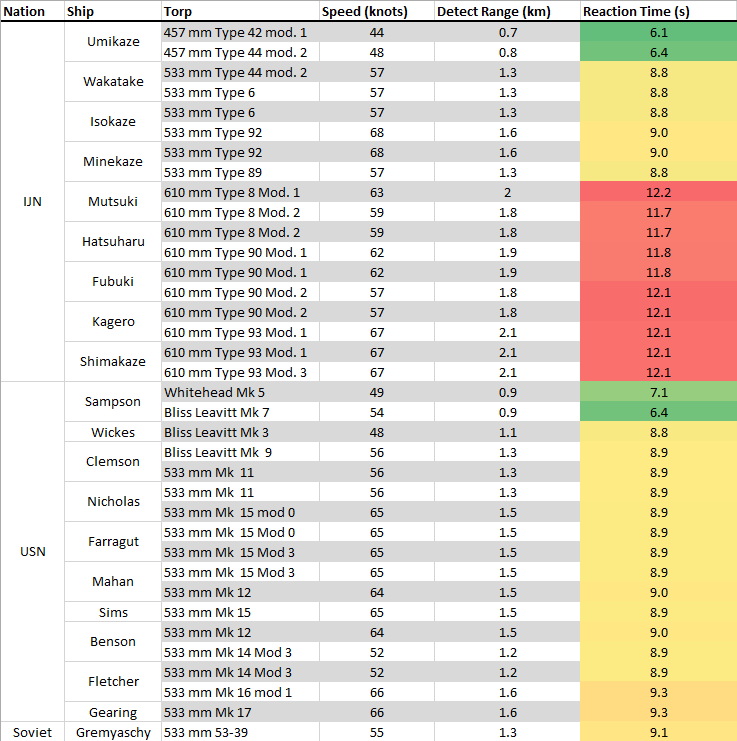 If one does the math, it's obvious that the Demolition Expert skill is very useful, especially for USN destroyers, in which it increases the fire chance per shell by 60-75% for mid-tier and high tier ships. Fire Prevention skill, on the other hand, is somewhat lackluster, since it lowers the fire chance per shell by 6-9% at best. Unlike HE, the AP shell does damage only if it penetrates the armor. The fuze of the AP shell is initiated after it passes through armor, and the fuze time is calculated so that the shell explodes after traveling about ten or so meters after passing through the armor -- that way the shell explodes around the middle of the battleship. That means that when AP shells are fired at lightly armored and relatively small target, they might over-penetrate -- explode once they passed through the entire ship, or not even explode, if the shell doesn't encounter enough armor to activate the fuze. Let's illustrate the fuzing concept with the Iowa's AP Mark 8 16 inch projectile. Its Mark 21 Base Detonating Fuze (BDF) had a delay of 0.033 seconds. Fuze activation requires a resistance equal to 1.5 inches (3.8 cm) of armor at 0 degrees obliquity or 0.375 inches (1 cm) at 65 degrees obliquity. The muzzle velocity for a new gun and a full charge is 762 meters per second. Therefore, if the shell were to immediately hit an armor plate 1.5 inches thick after exiting the barrel, it would explode 762*0.033 = 25 meters after passing through that armor plate. Most AP shells in game have a fuzing time of 0.033 seconds, but there are shells with as much as 0.1 second fuzing time. As of patch 0.3.1, the armor thickness necessary for AP shell fuzing was as follows (caliber - armor): 410mm - 68mm, 356mm - 59mm, 203mm - 34mm, 155mm - 26mm. Properly angling the ship matters a great deal when the enemy is shooting AP shells: when an AP shell encounters armor at an angle, it has to pass a greater amount of armor for penetration. Additionally, at certain critical angle (below ~20-40°), the shell will simply ricochet, even if it might have ad enough armor penetration. A shell may still cause damage after the ricochet, but only to the same ship. 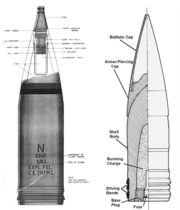 If the armor thickness is less than 1/20 of shell's caliber, a ricochet does not occur regardless of armor encounter angle. There are certain engagement ranges when AP shells will encounter both the belt and the deck armor at fairly large angles, and will have a high probability of either non-penetration or ricochets. The distance at which both plunging fire and direct enemy fire is less effective is called the immunity zone (IZ). Despite the absolutist nature of its name, the immunity zone concept does not imply any sort of invulnerability. A ship fighting within its IZ will still probably suffer when hit, but it is theoretically proof against singularly catastrophic hits to the citadel. Finally, AP shells can penetrate ship's armor even below the waterline, after traveling through water. The illustration to the left depicts a typical underwater trajectory of an AP shell: (1) - shell enters the water and is fuzed due to rapid deceleration (2) - trajectory angle changed (this happens every time an AP shell hits water) (3) - after a short delay, the fuze explodes the shell. The image also demonstrates two outcomes of an underwater hit: armor penetration, and a ricochet. As of 0.4 the underwater hits do not cause flooding. As a general rule, the secondary guns with caliber below 140mm have HE ammo, while secondaries with caliber above 140mm have AP shells. Secondaries fire only when an entire enemy ship is visible; if the enemy is partially obscured by an island the secondaries will not fire. 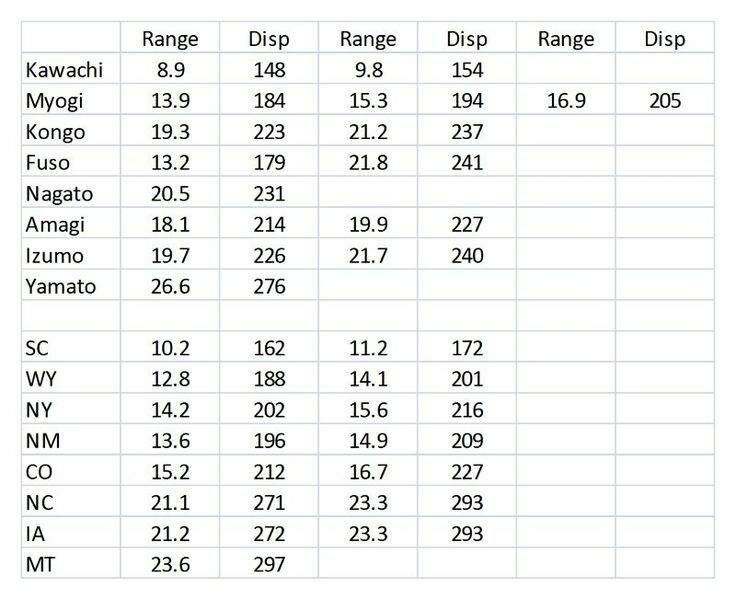 Shooting other battleships with AP is most effective with direct fire at point-black and medium ranges, roughly up to ~10-12 kilometers. The enemy battleship shouldn't be at too great of an angle; ideally, it should be perpendicular to your line of fire. You might also get some citadel hits with plunging fire at maximum fire ranges. If you aren't positive that you have a good chance of penetrating the citadel, HE shells are a better choice. Against lightly-armored cruisers and carriers, you should be using HE shells -- they have enough armor penetration to damage citadels. However, some carriers have enough armor to resist HE, and AP should be shot at them. You should also use HE against destroyers -- AP shells would almost always over-penetrate; and besides HE shells will knock out multiple modules on a DD, making it easy prey after a few hits. One last thing: it's better to use the shell of the wrong type (e.g. AP against a destroyer that suddenly materialized near your ship), then to start a long half-minute reload. Sub-optimal damage is better than no damage at all. Against battleships your best bet is HE shells. Consistent HE hits and nonstop fires are a bane of many battleship drivers' existence. However, don't try to fight a battleship single-handily; a skilled BB driver can dispatch you in a few well-aimed AP salvos. At point-blank ranges and favorable angles you can also try to penetrate the battleship's citadel with AP shells, though it's generally not a good idea to be that close to a battleship in the first place. Against other cruisers and carriers use AP shells at close and medium ranges, when you can reliably hit the citadel: a well-aimed salvo remove as much as half of the other cruiser's HP. If the cruiser is far away, or is angling too much, use HE; HE should also be used against the destroyers in practically all situations. Your main weapon is a torpedo, especially if you're driving an IJN DD. However, HE shells can still be very useful when fighting other destroyers, or providing additional fire against enemy capital ships -- in the latter case, your shells won't be doing much damage, but you can make up for that with the sheer number of shells, and fires. AP shells can sometimes be used against lightly armored enemy cruisers, since you have just enough armor penetration to defeat their citadel armor. However perfectly a naval gun on a stationary ship may be laying, successive rounds will not impact on a single point but will fall in a pattern scattered both in deflection and in range. 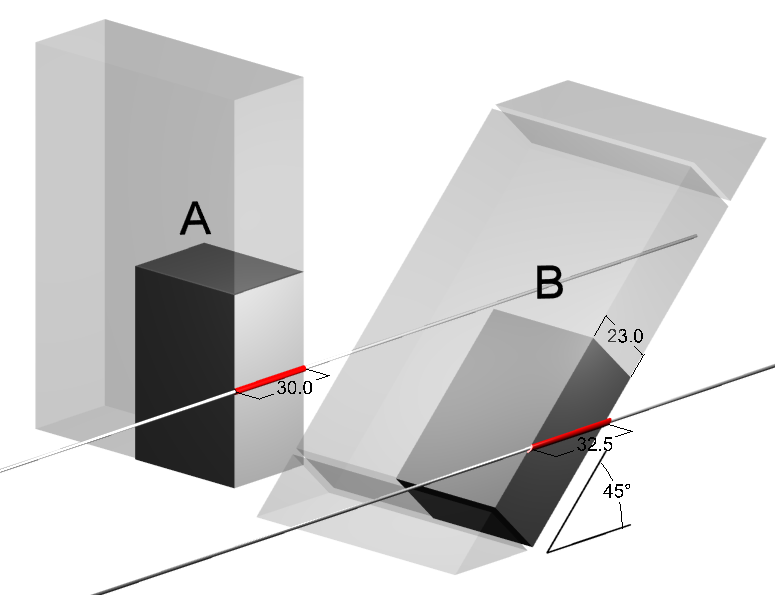 This phenomenon is called dispersion and, irrespective of human and constant error, it is caused by multiple inherent factors: minor variations in the weight of the projectile, differences in the rate of ignition of the propellant, variations in the temperature of the bore from round to round, physical limitations of precision in setting values of deflection and quadrant elevation on the respective scales, minor variations in wind, air density or air pressure, and so on. Observing the position of the surface bursts around our point of aim, we find that they fall into a roughly elliptical area in relation to the line of fire. An ellipse constructed around the dispersion area is called the dispersion ellipse. Every time a player orders his main caliber guns to fire, the game engine constructs a 2-D ellipse around the point of aim, and does so independently for each salvo fired. A double-click will fire all guns in one salvo with one dispersion ellipse, sequential fire will construct dispersion ellipse for each turret salvo separately. This ellipse has a certain length and width values, which are dependent on the characteristics of the gun. 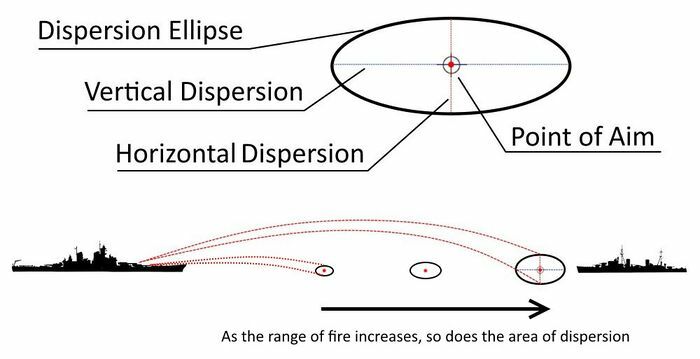 The dispersion value displayed in port is the horizontal length of the dispersion ellipse at the maximum fire range, i.e. a value that describes the lateral distribution of the shells relative to the player's ship. If the shooting distance is below the maximum range, the horizontal dispersion value decreases accordingly. Horizontal dispersion values at distances other than maximum firing range, as well as the vertical dispersion values have not been made public by WarGaming. Shell impacts within the dispersion ellipse are not uniformly distributed over the surface, but lie more thickly towards the center of aim. The intensity with which the shells fall in different points of the area of dispersion, can be described by a Gaussian (normal) distribution. In ballistics, the dispersion of shells is normally described by the three sigma rule, i.e. by three standard deviations -- the so-called 68–95–99.7 rule. To illustrate that rule, let's look at USN battleship Iowa: fully upgraded, it has a dispersion value of 293 meters. At maximum fire range of 23.3 km 68% of all shells will deviate no more than one-third of the in-port dispersion value (i.e. 49 meters to the left and 49 meters to the right of the point of aim). Furthermore, 95% of all Iowa's shells at maximum fire range will deviate no more than two-thirds of the in-port dispersion value (i.e. 98 meters to the left or to the right of the point of aim). 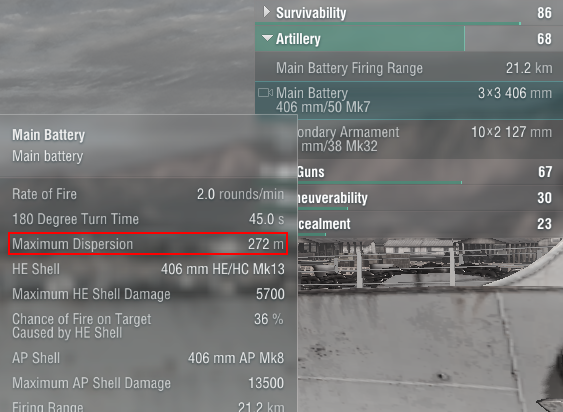 Dispersion values are same for HE and AP shells of the same gun. The player's gun dispersion value can be modified by player's equipment and by enemy's camouflage. 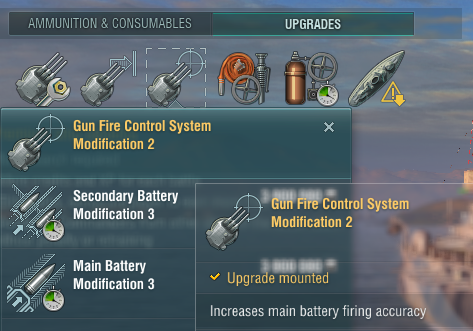 Gun Fire Control System Modification 2 decreases the shell dispersion by 7%. For fully upgraded Iowa, that would mean that at the maximum fire range of 23.3 km the horizontal dispersion would become 272 meters instead of 293 meters. Type 2 camouflage increases enemy's dispersion by 4%; at the maximum fire range a fully upgraded enemy Iowa would then have a horizontal dispersion of 305 meters. Additionally, WarGaming has indicated that not acquiring the target with the X button increases dispersion by an unspecified amount. Curiously, one could hypothesize that battleship dispersion at ranges below maximum also follows this linear pattern. For example, even though WG does not disclose Iowa's dispersion at 10 kilometers, by looking at this graph we can estimate it to be around 150 meters, etc. 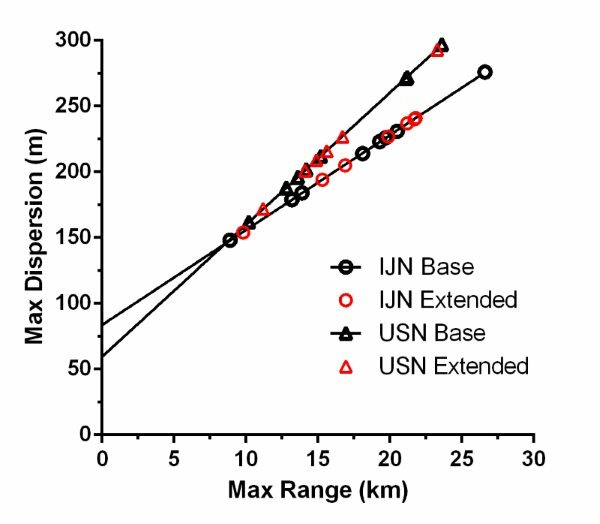 If that is correct, then all IJN battleship have superior accuracy to their USN brethren at ranges above ~10 kilometers, and vice versa. For patch 0.4.1, WG is considering decreasing the close-range (i.e. below 3km) dispersion values for the battleships. Danke für die Info Fischi ! Vieles war bekannt, aber sehr vieles war NEU und somit ein fettes DANKE!